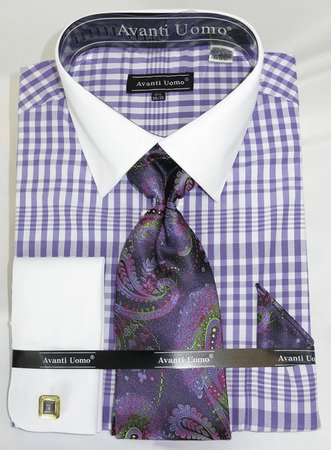 Get on top of the style scene when you wear fancy french cuff shirt and tie sets by Avanti Uomo. These stylish shirts have the Italian style that always works every day of the week. This purple and white gingham pattern french cuff shirt features the matching tie set and contrasting all white collar that gives you the look that stands out. Made of cotton fabric.